Hank is helping the cowboys with the dangerous mission of rounding up a very angry bull when a strange twist of events brings a yellow Labrador onto the scene. The entire ranch quickly becomes enamored with this new addition to the ranch’s Security Division. Who wouldn’t love a good-natured dog who strikes fear into the hearts of angry bovine, wears a big sloppy grin all day, and adores the ranch kids? Where will Hank fit in now that there is a Perfect Dog on the scene? This is another Hank the Cowdog book that I think ranks as one of the better ones. 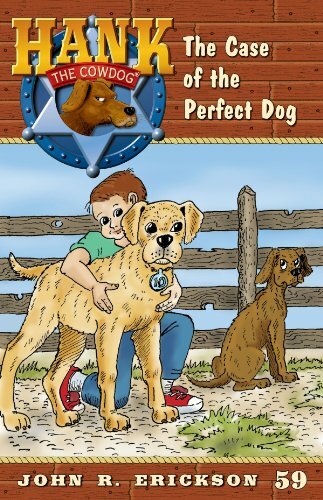 A big, yellow lab shows up during a great embarrassing time for Hank and everyone on the ranch, besides Hank, believes the lab, Happy, is most perfect dog ever. This book has teasing, mild language, and Happy does through-up at a point in the story, but the scene is hilarious because of why Happy throws-up. Like other Hank books it is for middle-school children who will find Hank and Happy quite a pair.